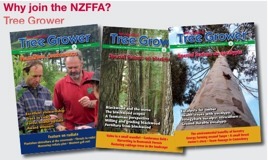 Harriet Palmer, New Zealand Tree Grower February 2019. Red needle cast is now a widespread needle disease of radiata pine, most evident in northern New Zealand. It is caused by a fungal-like organism, Phytophora pluvialis. Growth losses of up to 40 per cent have been recorded after a bad disease season. A considerable research effort, partly funded by the Forest Growers Levy, is making good progress on the problems of red needle cast in the short and long term, and providing decision support to owners about its control. Red needle cast first appeared in New Zealand in 2008. There is evidence that it was introduced from North America where it infects Douglas-fir although in New Zealand it is a serious disease of radiata pine. It is most severe in the northern North Island but is found throughout much of the North Island and northern South Island. Rarely if ever kills the trees because the needles regrow the following year. Scion researchers have been working for several years to develop a cost-effective aerial spray treatment for red needle cast. The plantation forest industry is very familiar with controlling needle diseases such as dothistroma and cyclaneusma by aerial spraying, and this is the best way to control red needle cast in the short term. Understanding the life cycle of the disease is an essential pre-cursor to chemical control. Pathologists have been studying how the disease behaves and interacts with its host to help determine the optimal timing and rate of chemical application. The disease has been monitored since it first appeared in New Zealand just over 10 years ago. Monitoring at 50 North Island forests over the past three years has confirmed that the disease generally appears in winter with spore release usually peaking towards the end of the winter. However, nothing with red needle cast is straight-forward as there is variation between years, regions and sites, making it a challenging disease to work with. Extensive lab-based trials at Scion started with a long list of 11 possible chemicals, from which copper has emerged as the one with most potential. Copper is well-known to the forest industry, is already used for dothistroma control and has been shown to be environmentally benign. The research moved out into the field, with small scale field trials using copper in Kinleith Forest, thanks to collaboration with Hancock Forest Management. In the field trials, copper sprays in February significantly reduced red needle cast severity as well as needle cast over the following winter. As with other needle disease spray programmes, the ideal method is to spray in advance of the disease appearing, knocking it on the head before it affects crop growth. Spraying in late summer is likely to become the recommended treatment. Unfortunately this means that forest owners in dothistroma-affected areas will need to spray twice each year because dothistroma spraying is undertaken in spring. Some major growers are now already implementing copper spraying programmes to combat red ned needle cast. Scion’s pathologists have also been working closely with colleagues to develop new ways of detecting red needle cast using satellite and other aerial imagery. Scientists can now identify the specific colour changes which signify red needle cast. This means they have been able to monitor changes over consecutive seasons as the disease builds up, needles are cast and then the trees recover. This type of monitoring will increase understanding of how the disease behaves at forest level from season to season – something which is not yet well understood. In contrast, drone imagery is useful for fine-scale detection and mapping, even down to individual tree level. A new technique being explored is the use of oblique imagery - this obtains information from the forest in three dimensions, to show features such as relative tree heights and stem characteristics, rather than simply looking down at the trees from above. Such information provides information on the effects across the crown to quantify the severity of the disease. Growers need support about spray prescriptions and timing, as well as on the cost-benefit of spraying. Scion researchers are busy developing a relatively straight forward model to give guidance on the costs and benefits of spray treatment. 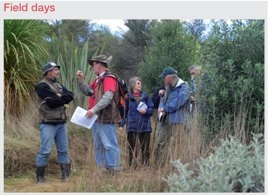 At the same time, work is underway on a much more powerful model, a prototype of which was presented at the recent Forest Growers Research conference in Tauranga. The model uses the significant amount of existing data about red needle cast which includes disease reports, lab and field trial data and remote sensing data. For the first time this is being combined with long run climate data and other physical site data such as slope and elevation, to produce a model. When this model is complete and incorporated with long range weather forecasts, it will be able to produce local outbreak alerts under different climatic conditions. Combining climate data with 10 years of disease reports, it has been possible to quantify how location and climate affect the incidence of red needle cast. Similarly, by analysing data from Scion’s network of breeding trials, they can determine the effect of tree genotype on susceptibility to red needle cast. The many different analyses have been combined into the new integrated model which will eventually test options for spraying decisions in forests in different locations.The model will be able to run forward in time and analyse the future effect of copper sprays in the coming season. Predictions will be specific for date and geographic location and able to take into account weather, tree genotype, stand age, current state of the forest, and disease history. Growers will be able to use the model to weigh up the probability and severity of a red needle cast outbreak on any particular site, and look at the cost-benefit of spraying. Integrate more trials, forest growth models, cost-benefit analyses and disease effects. In the long term the best solution to counter-acting red needle cast is to breed trees which are tolerant to the disease. Scion’s tree breeders are busy working with the Radiata Pine Breeding Company to develop new radiata pine genotypes which are resistant to red needle cast as well as dothistroma and cylcaneusma, the two most damaging needle diseases affecting radiata pine in New Zealand. Breeders have some very useful genomic technology at their fingertips which greatly enhances and speeds up the capacity to produce designer trees with specific properties. Research at gene level will identify which host genes within radiata pine produce resistance to red needle cast. This information can then be used to combine these with genotypes already identified as carrying dothistroma and cyclaneusma resistance. Growers will benefit from the development of superior planting stock capable of tolerating radiata pine’s main needle diseases throughout the rotation. For more information about any of the research mentioned here, contact Nari Williams who leads the Healthy Trees, Healthy Futures programme at Scion − nari.williams@scionresearch.com.